I had high hopes for the beginning of 2016. I’d taken 3 months off work to fish the rivers in the hope of getting a decent Perch or two but lets just say the weather had different ideas. I lost most of January to high river levels and persistent rain although it didn’t stop me going out. I wanted to experiment and see just what conditions Perch would feed in. Although they didn’t feed in extreme conditions I did take some nice fish when the rivers were high with quite a bit of colour in the water proving that it’s always worth getting out there and giving it a go. 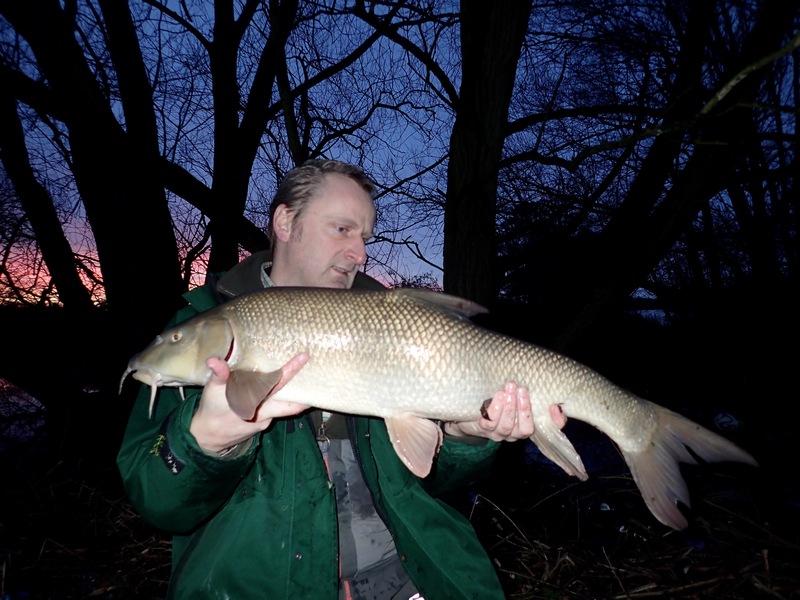 I did manage some nice Barbel and Carp though when the river was close to going over the banks which gave me quite a runaround on 10 foot quiver tip rods and 6lb line. I gave those fish a lot of teddy on that gear and not once did I feel it was going to fail me proving that with balanced gear you can land some pretty hefty fish. Thanks for my Christmas present Santa. Let’s get one thing straight, I hate Christmas. There I said it. I don’t care if it makes me sound miserable but the whole festive period is nothing but a pain in the arse in my opinion and I can’t wait for the first day back at work after the festive period so I can have a bit of normality back in my life. So with me being a singleton this year it meant I didn’t have to put up with all the festive clap trap that comes with being in a relationship. If it wasn’t for my son I wouldn’t even bother putting a tree up but I had to make an effort for him really. In truth I’ve not been fishing much this summer and autumn. In fact until recently it had been a couple of months since i’d been out. Usually i’m out a couple of times a week but i’ve been looking for a new challenge as i’m finding my usual bits of river a bit dull. Yes i’d like a 5lb Perch and yes if I keep fishing the same areas I may very well get one but do I want to keep fishing the same spots? No I don’t. 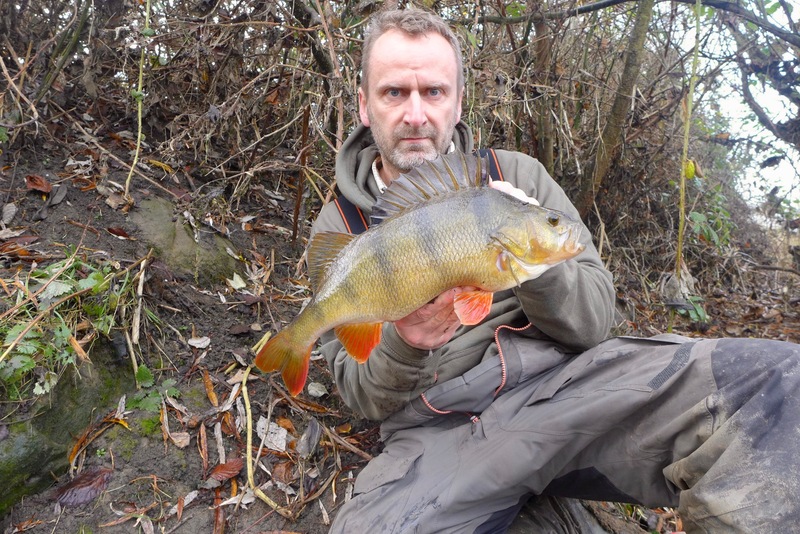 I’ve had more 4lb+ Perch out of the river than I’m probably entitled to and it’s become a bit stale. Having said that, where did I end up today? Yep on my usual river albeit a stretch that I haven’t fished for many years. The reason why I ended up on said stretch is because today we had a fish-in for “The Perchfishers”. I love the get togethers that the club organises as it’s good to meet up with fellow Perch fishermen from around the country and have a natter. 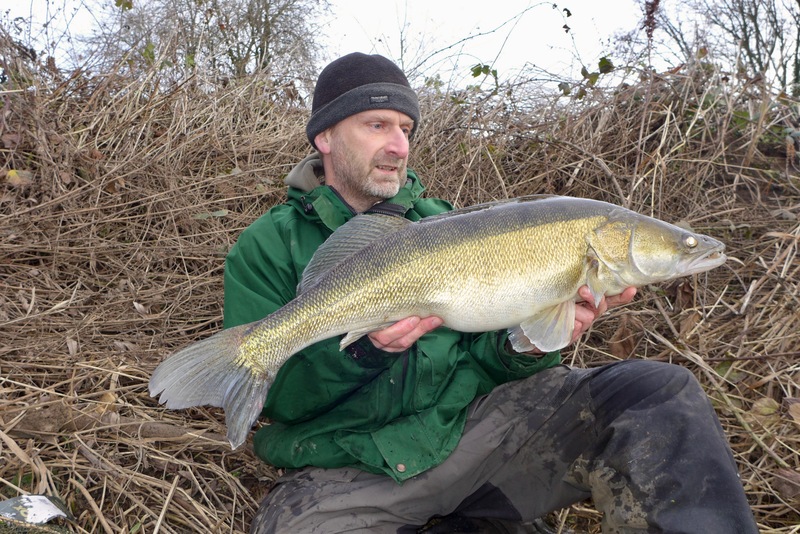 The stretch in question has produced some very big fish in the past and I was really hoping someone would get a lump, preferably someone who wanted to up there personal best. There’s a lot of water to go at and in truth we could have done with twice as many people fishing to get an idea of the quality of the fishing. After meeting everyone in the car park I made my way down to the river to find one of the members had already had a 2lb+ fish. Good start I thought and the conditions were perfect so I was hoping a few more fish would follow. I started off fishing down the edge in a good looking spot with plenty of cover and a good depth in front of me but for the first hour I didn’t manage a bite. I moved further downstream to another Perchy looking spot with a nie bit of slack water off the main crease. I put both rods out in anticipation of a bite straight away but after a short while I wasn’t getting that fuzzy feeling. From my position I could see what looked like a nice spot further downstream so I packed my gear up and headed down there only to find another angler tucked away in that spot. Feeling a bit dejected I walked a bit further where I found another good looking spot. This one looked shallower though and in fairness that doesn’t really bother me. I don’t buy this “perch move into deeper water in Winter” nonsense, although today was more like a Summer’s day. I put one rod 10 yards downstream about a yard and a half from the bank, and the other rod directly out in front of me behind an overhanging willow. Although I knew the water was shallow it was even more shallow than I thought with somewhere in the region of 2 – 3 foot. I settled into my new position and started to faff about with something, although I can’t remember what I was faffing with when I saw the downstream rod pull straight over (yes Perch are very shy biters) and I hit into something which exploded on the surface. Faffing was well and truly stopped as I concentrated on the task in hand. My initial thoughts were Trout but the fish wasn’t zipping around like a spottie and then I thought it must be a Chub as the fish really was giving a good account of itself. As it got nearer I saw it roll under the surface and it was a bloody Perch and a good one looking at it too. I calmed myself and readied the net and took my time before I eventually scooped the fish up. I knew it was over 3 but not a 4 and I estimated it at 3.8 and upon weighing it came in at 3.6 and was more than happy. I continued to fish on hoping for another fish but that was to be the only bite of the day. I met up with my fellow fisherman at the end of the day and although a few fish had been caught no one managed a proper lump. Still it was good to be back on the river but I’m still looking for that next challenge. Answers on a postcard please. 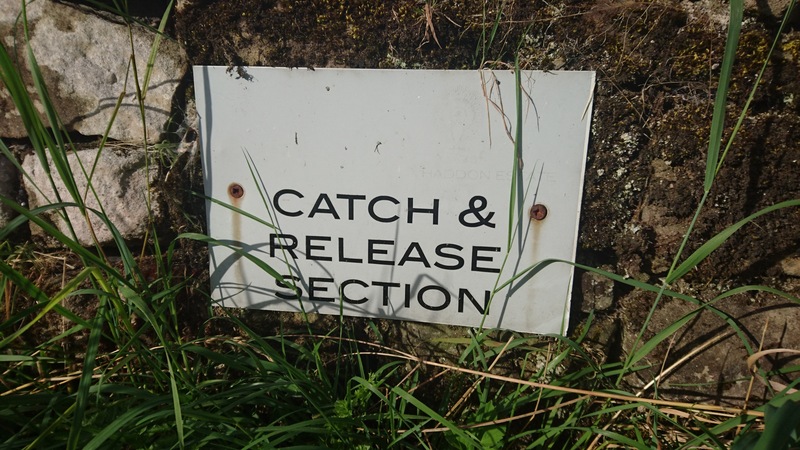 Fishing trips are short affairs at the minute so expectations aren’t too high. After a day doing menial tasks I sat down for the evening expecting to chill out but I just couldn’t settle. The time was 7:45pm and I thought sod it, i’m going on the river for a couple of hours. By the time i’d got my stuff together and got to the river it was just before 9pm. Fortunately my zander gear was ready from my previous trip so I plonked myself in a new swim and all ready to go. 20 minutes later and it didn’t feel right so I upped sticks and moved upstream a few swims. By now it was getting dark so I went to get the betalights and put them in the bobbins. DAMN IT!!!! I’d left them at home in the pocket of my other fishing trousers. This is generally what happens when I go at the last minute. I always forget something. Up until probably six years ago it’s fair to say most of my fishing consisted of creeping along river banks on my hands and knees stalking wild trout. For more years than I care to remember fly fishing took up 90% of my fishing while the other 10% was spent coarse fishing. Then inexplicably I got fed up with this kind of fishing and the roles reversed.